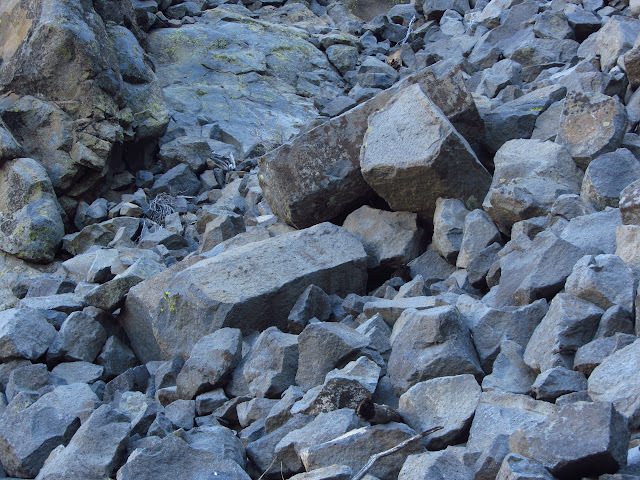 Hexagonal rocks that have broken off from the local postpile. 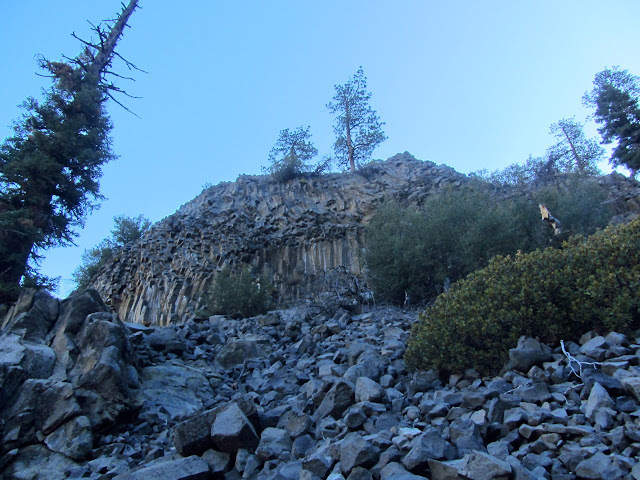 The postpile above where the rocks came from. 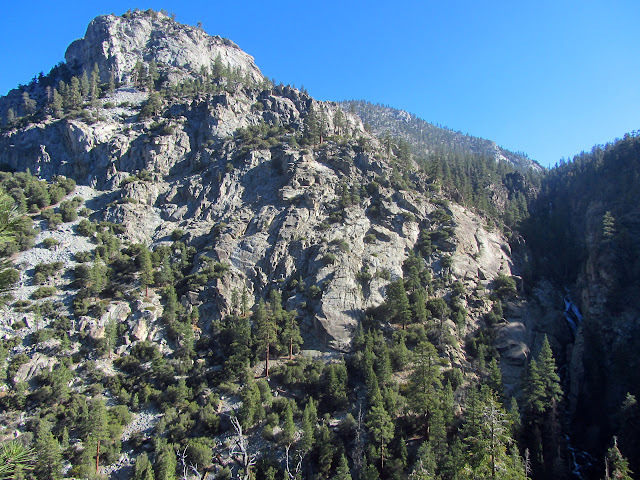 Above the postpile, I can hear a new roar almost entirely muted by the rocks around it. 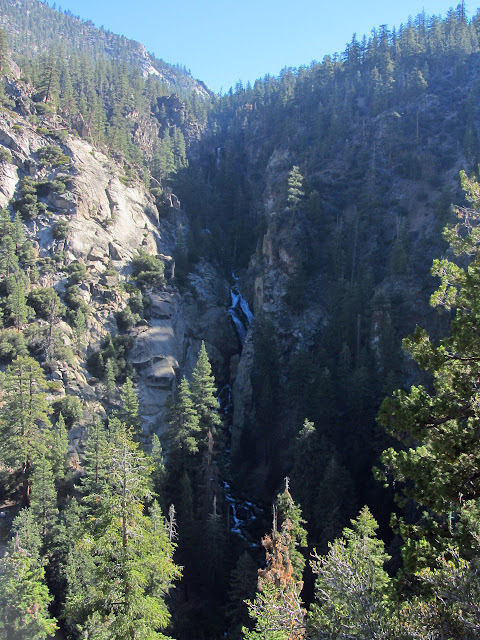 Moving off trail toward the cliffs, I am greeted with a view of a huge waterfall. 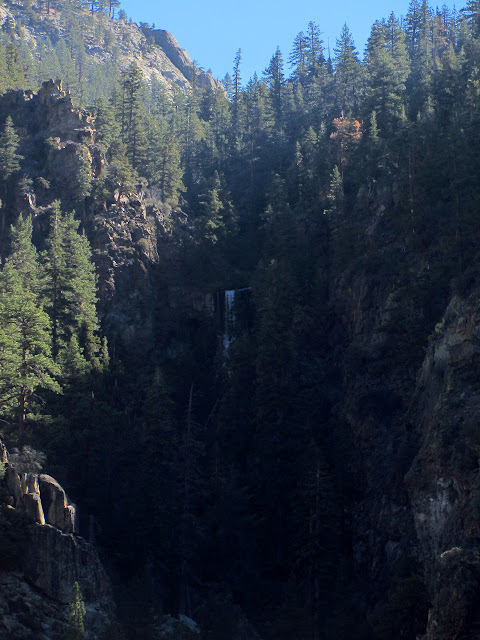 At first, my attention is grabbed by a huge cascade of white water halfway down the steeply dropping canyon. Gradually, I start to see more and more of this expanse of water including a vertical drop high up the canyon. The trail soon comes to its own viewpoint of the falls, but rocks on this side of the canyon obscure more and more of it as one travels east. I decide I want to spend a little more time with the waterfall and get out the art supplies. The whitewater cascade that takes my attention first as I try to take in Volcano Falls from my first viewpoint. From a second viewpoint a little to the west, the falls are not quite as obscured by the rocks on my side of the canyon. The top tier of Volcano Falls, probably the part that is considered the actual waterfall. What it looks like around where the waterfall comes down. 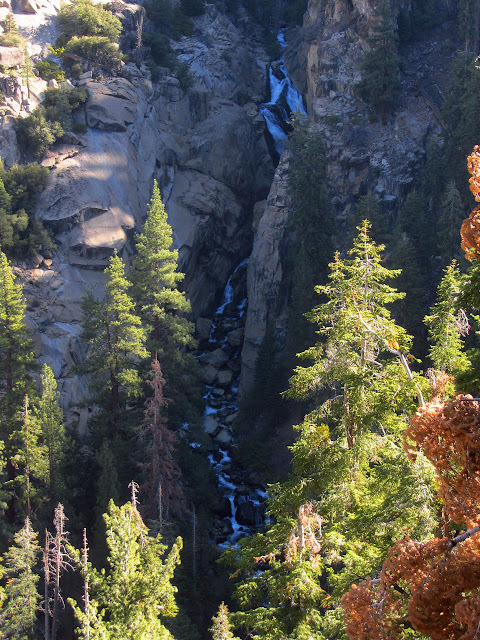 Once near the waterfall, the trail does not climb so steeply. I find myself wandering through forest over lava rocks or through meadows with deer. 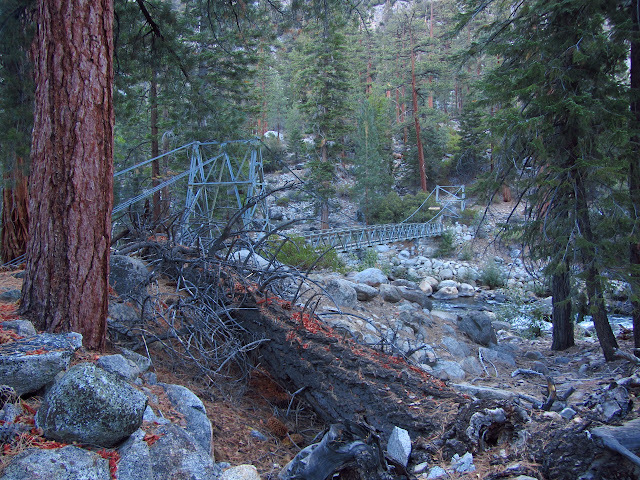 Although Golden Trout Creek is still inaccessible, there are three streams along the way with plenty of water to supply the needy traveler. Eventually, I get to the second natural feature of the area so striking that it even appears on the old 30' quad: the natural bridge. 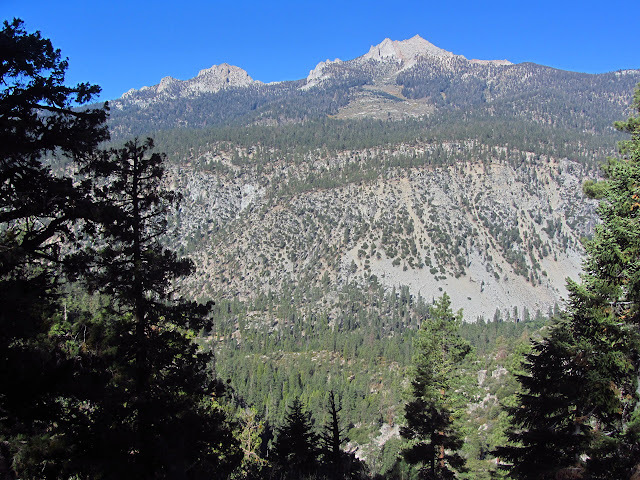 The Coyote Peaks rising above what is still visible of Kern Canyon. 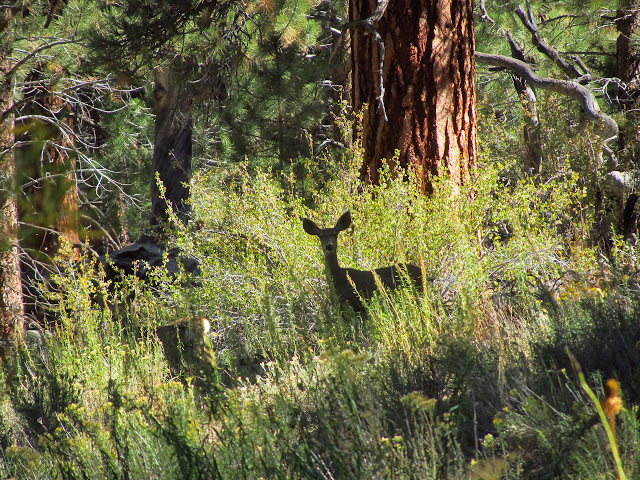 A doe and one of two fauns look on alertly before trotting off without much hurry near one stream. 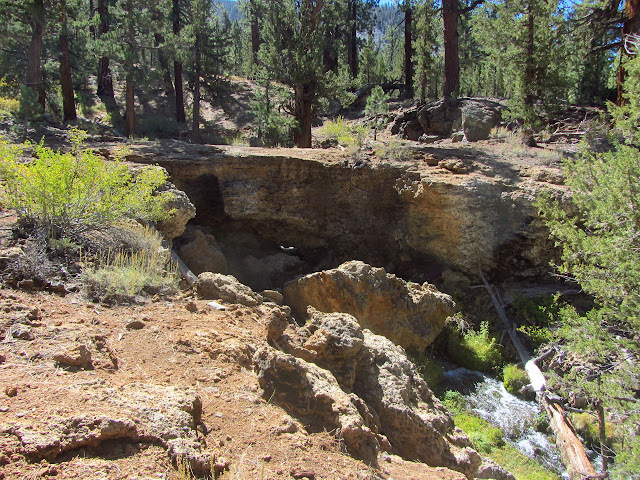 The trail winds through lava rocks in the forest and over this natural bridge. I am never sure what to expect of a natural bridge. The one above Arcadia is rather disappointing. This one is a consequence of the lava flow which probably left some holes as it covered the land. 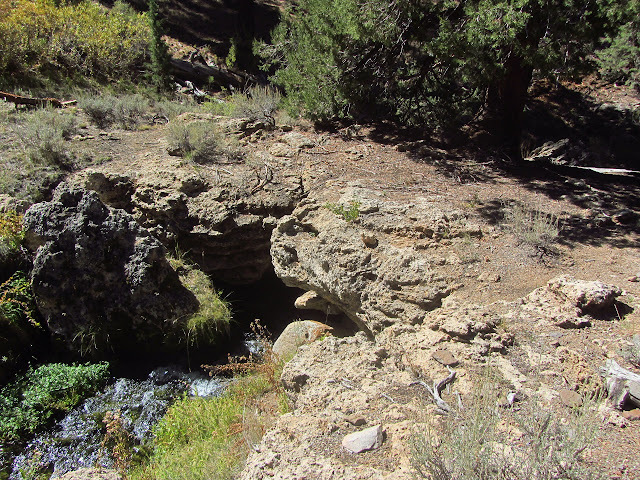 There are actually two natural bridges in the area, but no more are apparent further along the creek well fed by springs. Looking at the bridge from below, a little daylight can be seen through the opening the creek is using. The second natural bridge is a little smaller and has a tree growing on it. More gentle climbing through lava and meadows eventually gets me to a signed junction to Volcano Meadow and to Little Whitney Meadow. I can see the gentle southwest slope of Mt. Langley again in the distance. There is another sign as the trail passes along the south side of the meadow for destinations to the north, but no trail apparent to go with the new sign. More signs out in the meadow likely lead the way to where the trail is visible. A large house sits on the other side of the meadow as well, probably another inholding. Another spring fed stream flowing through lush grasses on one small meadow. 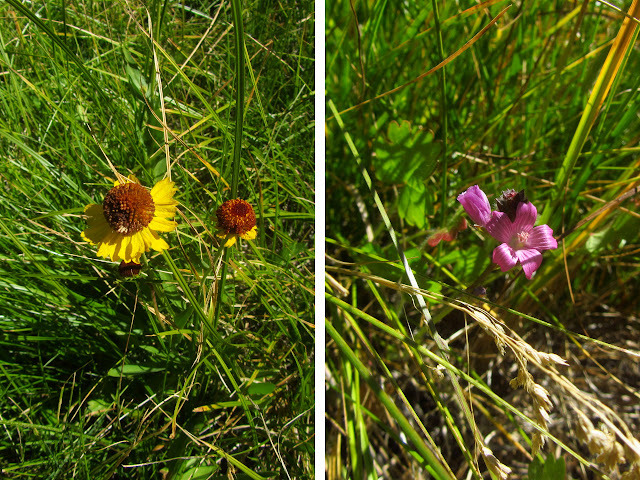 Only a few flowers still remain. 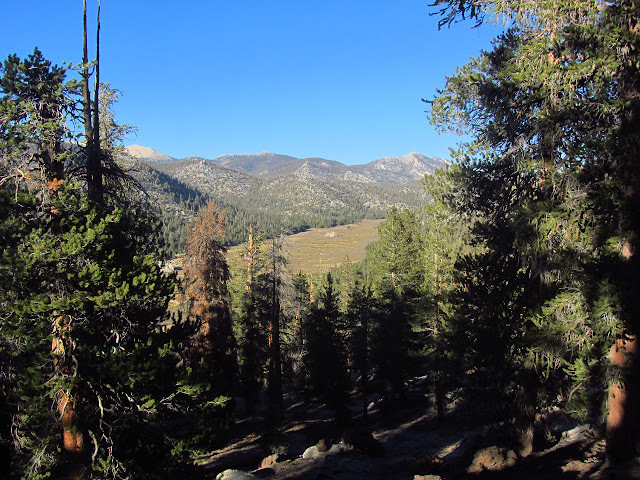 Entering into Little Whitney Meadow. There is a cow camp just before leaving the meadow again. 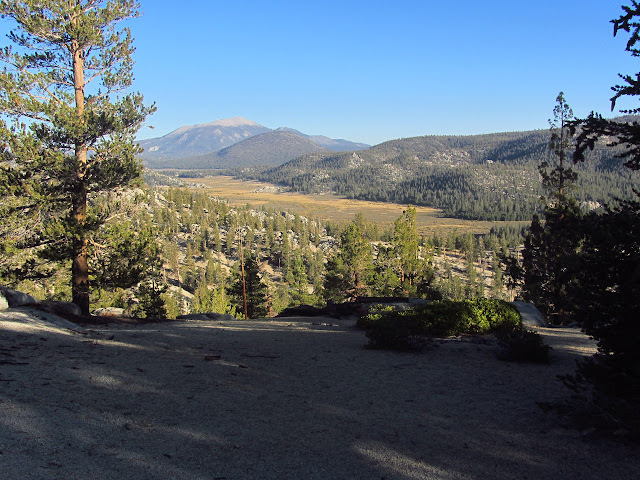 The trail crosses Golden Trout Creek and climbs up into more sandy stuff. Granite outcrops are on my left and a dark lava flow is on my right. When views open up, little cinder cones are visible in all directions. More recent lava leavings than what I have been walking over. 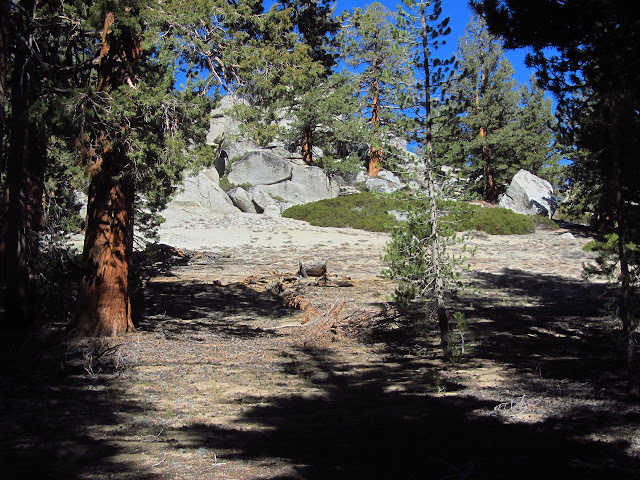 Small granite peaks keep popping up. 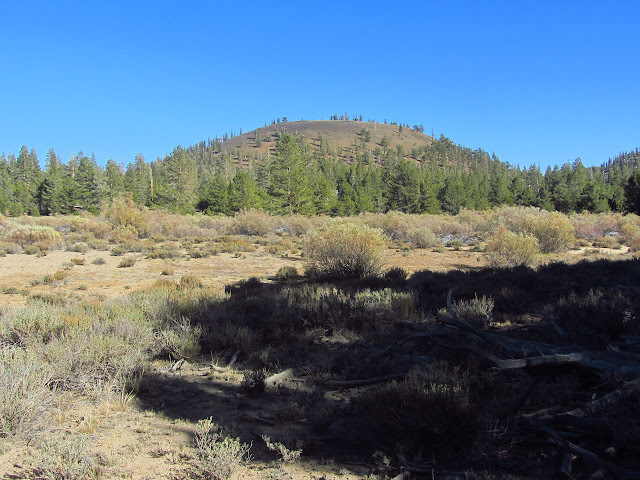 A wide black cinder cone to the south with Kern Peak behind it. 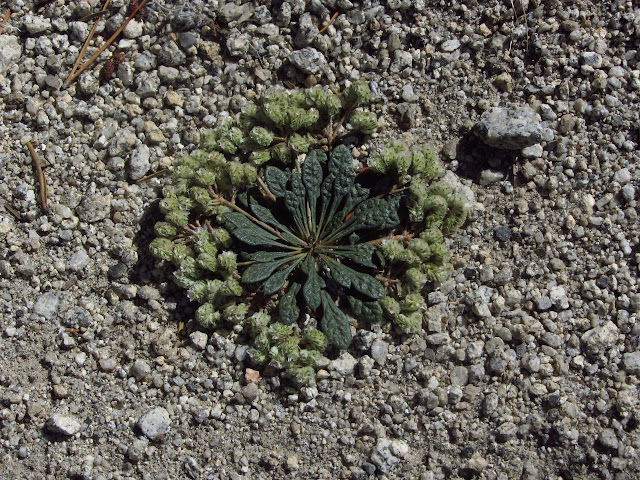 An oddity flowering in the sands. 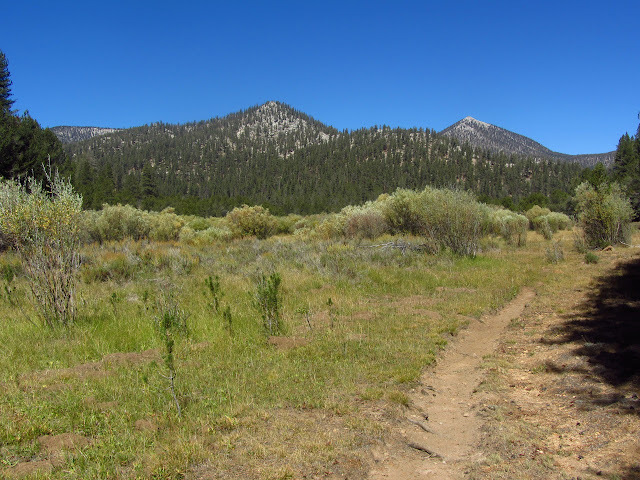 There is another junction with another trail leading to Volcano Meadow, then another meadow. The trail seems to multiply as it gets closer to the various junctions at the south end of Tunnel Meadow. 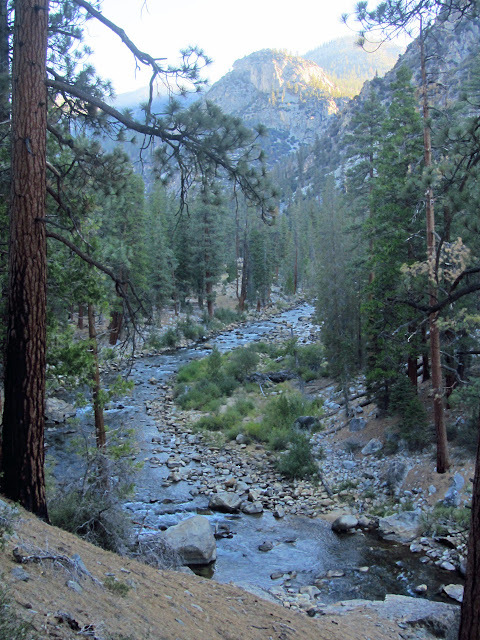 I cross back over Golden Trout Creek and find myself a camping spot for the night. I have now made up all the miles I needed to make up. Just over a small rise, there is another group with support also settling down for the night. 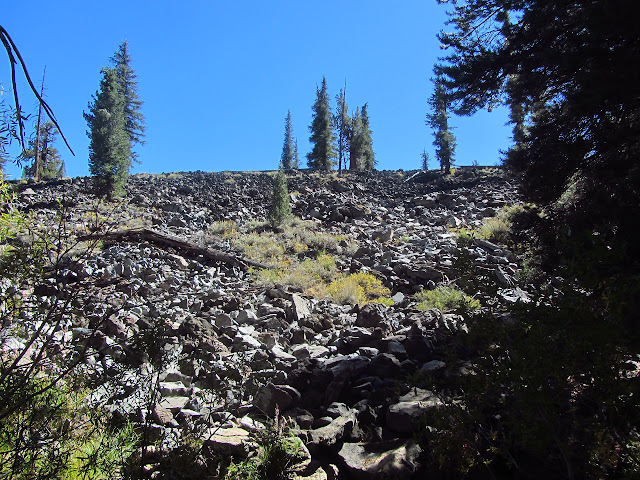 Another cinder cone near the south end of Tunnel Meadow. 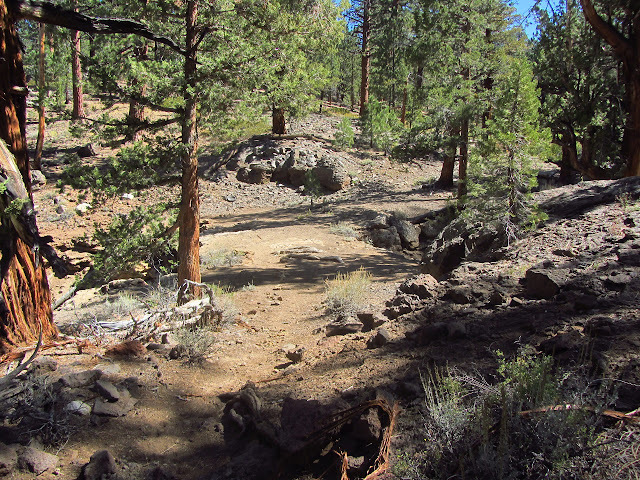 I still have an hour at least of time to explore and there is another of those benchmarks marked on the 1905 Olancha quad in the area. This one is also not one I planned on looking for because it is simply along a ridge, not at a peak. It does have an elevation and is probably on some minor peak along the way, so I go for it. First I want to head north toward the old guard station and "The Tunnel", whatever that might be, then start up the ridge trying to miss the many false peaks before the one I want. 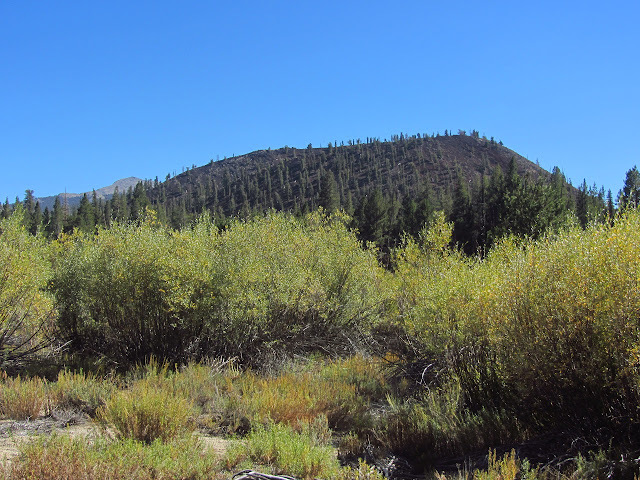 I have to cross the South Fork of the Kern River to get to the ridge and find that is is much smaller here than the creek it shares a canyon with briefly. The views are good from up on the ridge east of the guard station, but I do not seem to be missing the false peaks for the most part, but am missing them just enough that if they turn out to be the right one, I will miss the monument, if it exists. Realizing I also left anything warm for my arms at my campsite, I decide this is a foolish climb and head back down into Tunnel Meadow. Looking down on Tunnel Meadow from up on the ridge. Mt. Langley is visible in the distance again. Looking down on Ramshaw Meadows from up on the ridge. 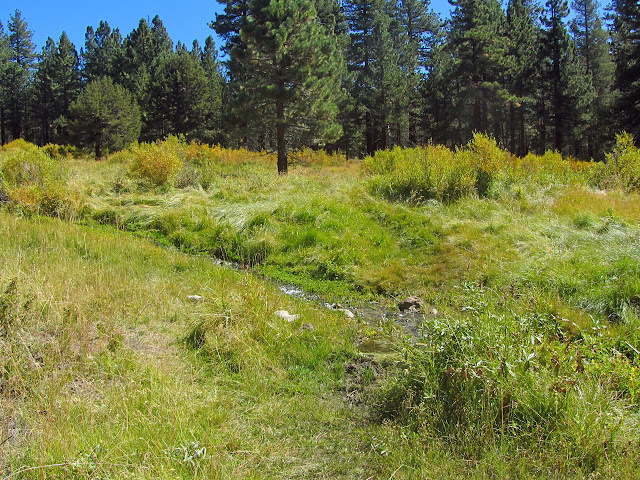 It is easy to cross Tunnel Meadow to the area of the trail, especially since the fences have been dropped for the winter. The south fork is just a hop when I come to it. I end up on a secondary trail that follows the inside of the fence rather than the official trail, but eventually climb up to it just before the area of the Tunnel Guard Station. Besides the old mule barn now being used as the station after it burned, there is the remnant of a water tower and a remote weather station. The door contains the obligatory "turn off the gas!" note, but no one is home today. 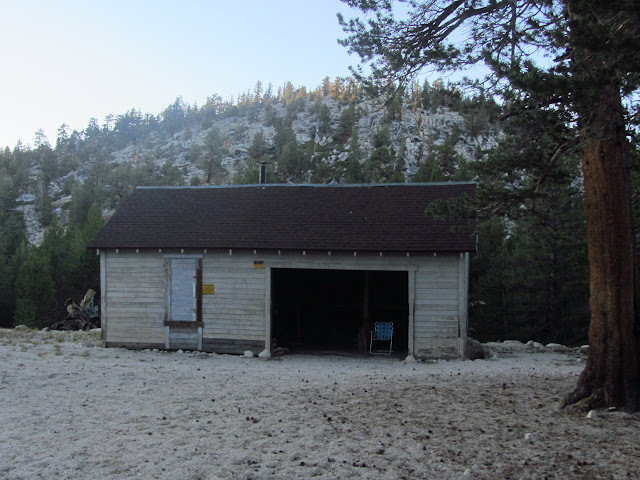 The old mule barn being used as the Tunnel Ranger Station now. 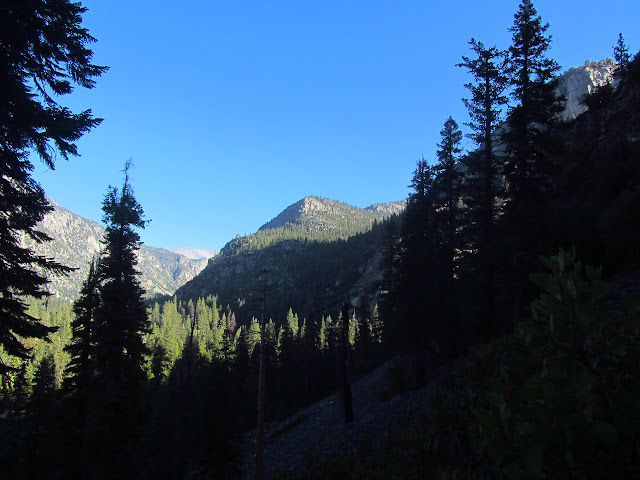 While I did not find the benchmark, I did determine exactly which trail I need to head out on tomorrow, which I did not know for certain in the maze of trails and extra trails. Chatting with my neighbors turns out to be quite helpful in finding out what exactly is "The Tunnel" marked on my old map. It seems it is all about water. Two creeks pass by and, as I observed, one is much smaller than the other. It seems the people with the rights to the south fork dug a tunnel to even things out a little. This was not looked upon kindly by those with rights to Golden Trout, who blew up the tunnel. It was dug and destroyed at least once more. It really is very curious how these two waterways come so close and do not join although the separation is soft and easy to dig through. Well, I am a silly goose. Sequoias, and all redwoods, are not pine trees. They are cypress trees just like cedars. Any pine needles I may have seen were snuck in by some ponderosa or something next to it. I shall have to pursue better, more subtle distinguishing characteristics. Yeah I was a bit surprised to read that you had a Sequoia in Kern Canyon though I didn't doubt you entirely as you did say it was young one,, so I figured its possible. As far as I know the only redwoods growing east of the Western Divide are in the Freeman Grove which is an anomaly as not only are they far more east than their brethren but it is a fairly large grove as well. The Freeman Grove contains the George Bush Sr. Tree approximately a mile up Freeman Creek from the paved Lloyd Meadows Road. Strange that he would have a tree named for himself and take the trouble to attend the ceremony to do it and yet fail to do any sort of executive action to protect the grove his tree is within. But that is politics which is controversial and therefore to be avoided.